End Cream Haters. 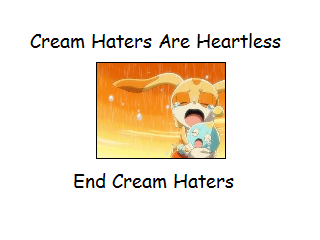 2/3 people who know about Cream hates her, it needs to stop.. Wallpaper and background images in the Cream the Rabbit club tagged: cream the rabbit sonic hedgehog cheese hater fan. 2/3 people who know about Cream hates her, it needs to stop. Why do they even hate CREAM,rceam did't even done anything to them.. CREAM HATERS MAKES MY DAY WORSE!!! Thanks for all the good comments, I found out that most Cream fans are teenage boys and girls, I am a teenage boy myself (14), but I have been a fan since I was only 10.